Heavensent: English Bulldog Rescue and Adoption in NJ. If you are interested in adopting a rescued Bulldog, please read our FAQ and complete the HSBR online adoption application. If you need to surrender a Bulldog, please call the Rescue Coordinator (see below) or send an email to HSrescue@aol.com. We would be happy to discuss our process and your concerns. After you submit your application, you will see a message on the screen that says that your application was submitted. Please DO NOT call the coordinators just to ask if we've received your application. If you have a technical problem with submitting your application, please send an email to the application database administrator at info@centralridge.com, or email us at HSrescue@aol.com. The waiting time to adopt a bulldog varies. We do not operate on a first-come, first-served basis. We find homes for rescued bulldogs, not the other way around, so we evaluate the dogs and then search the applications for the best match. Your chances of being contacted about adopting a bulldog are much better if you answer ALL of the questions on the application. If you have information that you want to add after your application is submitted (e.g., additional references, change of address or other circumstances), you can email it to us and we will add it to your application. We appreciate your patience. 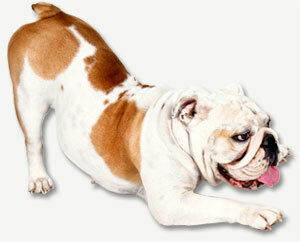 We are a small, volunteer-staffed organization and we foster the Adoptable Bulldogs in our homes. Most of us work full-time jobs, so although our hearts are in rescue, we might not be able to respond to you immediately. We will do our best, though, to be responsive! If you have questions about the adoption process, please read the FAQ before emailing a Rescue Coordinator. © Copyright 2006 - 2010, HeavenSent Bulldog Rescue. All Rights Reserved. Permission must be granted for publication in whole or part. | Read Legal. Our website design and management are donations from April Robin Designs.